Chinese Hook Sword Twin Set – 2 Pc. Set Silver, 33 In. These battle-ready swords were designed for Martial Arts combat and are customarily wielded as a pair, featuring solid stainless steel construction. The blade is crafted to knock oncoming steel of your way. 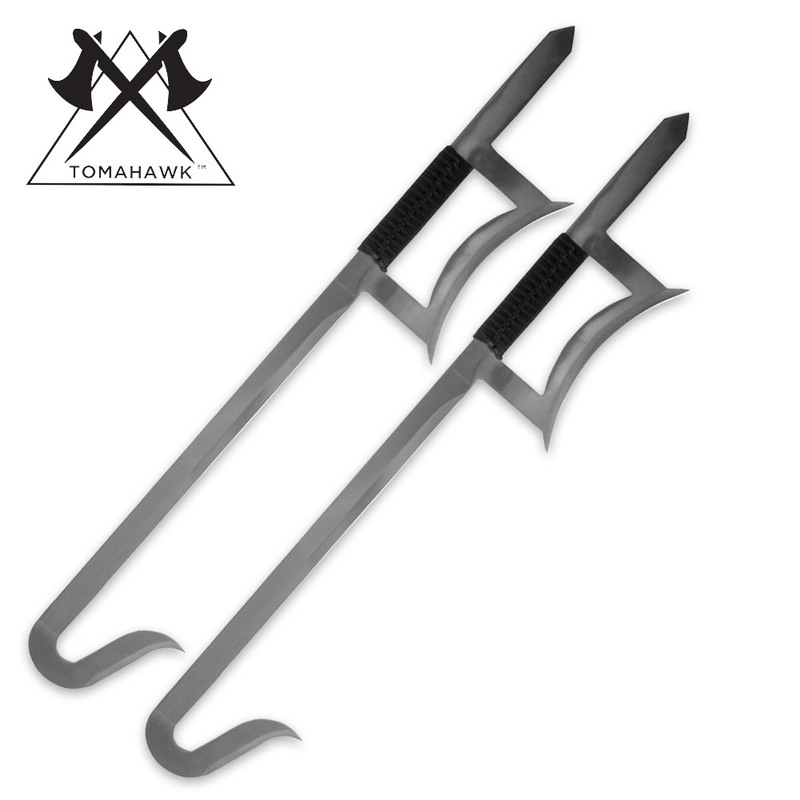 The cord-wrapped handle is guarded with the traditional half moon offering yet another tool for sparring. The ultimate defense duo! 33" overall. They look great in my collection. I've always wanted hook swords and when I got these they were perfect! A lot sharper than my friends and I expected but that was more bad news for them than myself. I love them! Definitely worth the buy! Not really a fan of stainless steel it's to weak in my opinion seeing as I've broken at least 5 or 6 swords made of the stuff, try carbon steel. I enjoyed the Swords but i couldn't find out what kind of steel they were.Im hoping 440 but i was not sure. Still a great blade for any collection. Awesome swords great buy.Swords came sharp right out the box,the nylon grip holds up really well i would reccomend these to anyone who is looking for EXCELLENT quality hook swords.I showed my friends these and they want one. There a must click the buy button right now.